A group of organisms formally recognized as distinct from other groups; the taxon rank in the hierarchy of biological classification below genus; the basic unit of biological classification, defined by the reproductive isolation of the group from all other groups of organisms. give rise to a new appearance, a new genetic code, and ultimately, a new species. 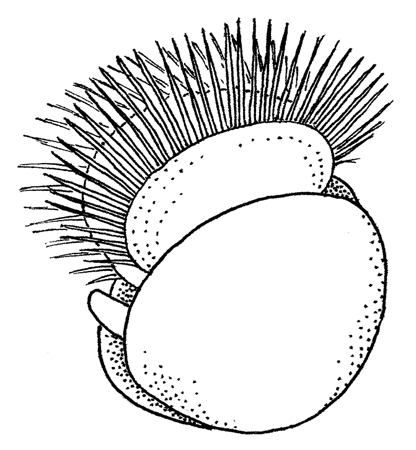 A comb-like structure along the ventral edge of the byssal notch in scallops in which the byssal threads rest.) that separate and support the byssal threads. 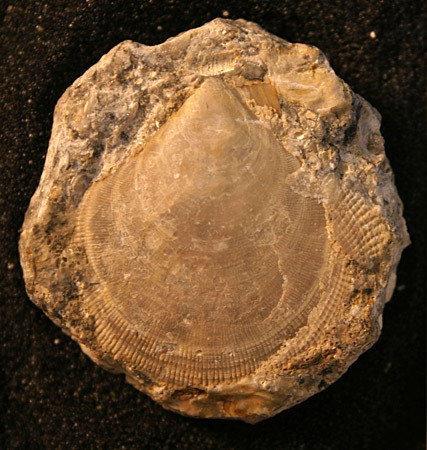 The direct ancestors of scallops were scallop-like bivalves of the family Entoliidae, which lived during the Paleozoic and Mesozoic Eras (400-65 million years ago). Entoliids had auricles and a byssal notch only as juveniles, but they did not have a ctenolium. 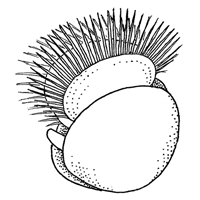 The ctenolium — a defining feature of the modern family Pectinidae — is a characteristic that evolved within the scallop lineage. 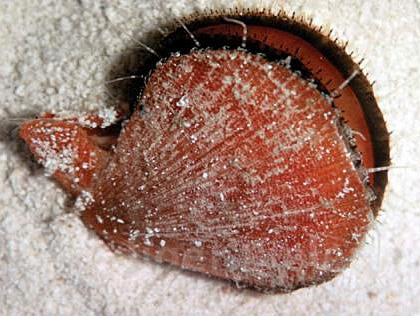 A living Sentis Scallop (Caribachlamys sentis) from the Florida Keys. 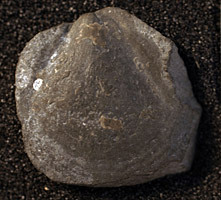 The notch between the auricle (at left) and the main body of the shell is the byssal notch, through which the foot and byssus extend. 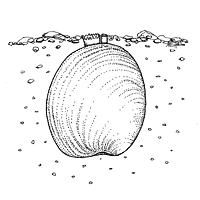 A comb-like structure along the ventral edge of the byssal notch in scallops in which the byssal threads rest. 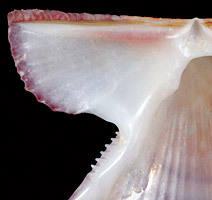 (the comb like teeth in the V-shaped indentation between the auricle and body of the shell) of Caribachlamys sentis from the Florida Keys helps separate and support its byssal threads. 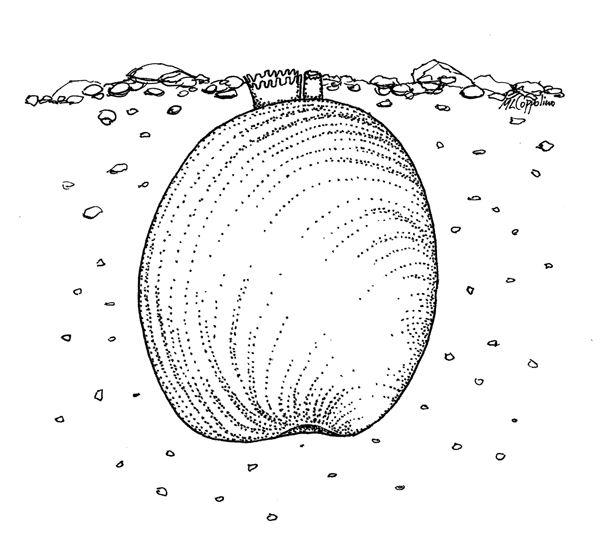 Many adult scallops do not use a byssus beyond the juvenile stage, and so lose the ctenolium as they grow larger. 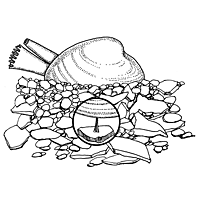 Rounded or pointed extremity of a bivalve shell, often projecting above the hinge line, that reflects the early growth stage (= oldest part of the shell) and includes the prodissoconch (larval shell) and adjacent convex area; also called the “beak.” at top center. An unidentified fossil scallop (Pectinidae, 3.7 cm diameter), from the Jurassic Period of Bradford-on-Avon, England, is preserved in a similar way to the older Entoliidae at left. Not all biological change is evolution. The metamorphosis, growth, and physical changes of an individual organism are biological changes but are not evolution. A tuft of long, tough filaments which are formed in a groove of the foot, and issue from between the valves of certain bivalve mollusks, by which they attach themselves to rocks, etc. to stabilize it in the sediment. 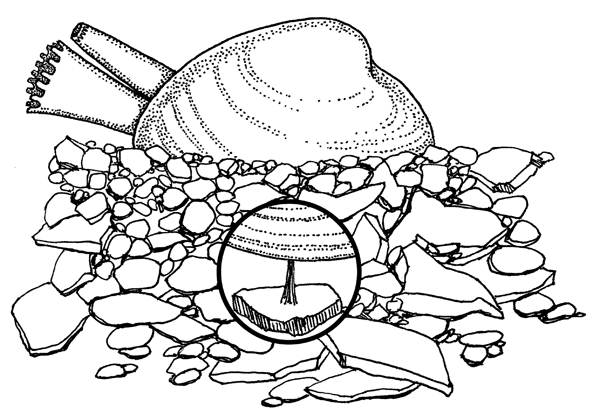 The clam's appearance changes quite dramatically from juvenile to adult; notice that the adult (below right) no longer uses a byssus, and has relatively shorter siphons than the attached juvenile. The process by which living forms with traits that better enable them to adapt to specific environmental pressures, e.g., predators, changes in climate, or competition for food or mates, will tend to survive and reproduce in greater numbers than others of their kind, thus ensuring the perpetuation of those favorable traits in succeeding generations.. The terms Darwinism and natural selection can be used interchangeably. Other mechanisms of evolution have also been accepted. Therefore, evolution is species change over time and Darwinism (natural selection) is just one of the mechanisms of how these changes occur. Why study evolution? Evolution is the unifying theory that explains all biological science. All life is connected and none of it can be fully understood without the theory of evolution. Imagine trying to study chemistry without understanding that molecules are made of atoms (atomic theory). Evolution allows us to understand the past, predict the future, and map the organization of our world. Evolutionary scientists from all fields of biology (paleontology, molecular biology, genetics, etc.) are using the most sophisticated research techniques and technologies to explain life. Understanding the evolution of bivalves can help prevent their extinction, prevent the spread of invasive species around the world, and can even help scientists date geological events. More information about the importance of evolution can be found in the Evolution in Everyday Life section.